Whilst we regularly discuss how professional carpet cleaning can achieve brilliant cleaning results, it is often thought that the pricing of such services provide a barrier. This is certainly not the case. We have identified a large number of clients who believe that their carpets needed replacing before acquiring our help. Unhealthy contaminants of lifted away from your carpets. 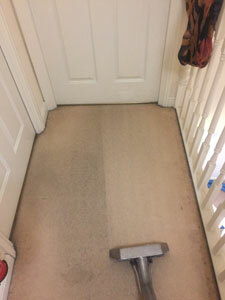 Even with the most careful clients, it is very difficult to stop any contaminants from getting into your carpet fibres. This process is natural and can be sped up if you have children or animals in your home. We were asked to deep clean these carpets in Little Chalfont. The homeowner wanted to make sure that she was doing all that she could to ensure the home environment was as clean as possible for her family. Did you know….? That a carpet acts like a filter against many particles such as food, bacteria, dust, soil, sand, mites or pollutants. Your carpet cannot continue to do this once it is saturated. This means that these particles aren’t filtered away and remain in your home environment. Once this client had enquired about our services and experienced first-hand our professional approach she signed up to our routine maintenance programme. This is where we pre-set arranged dates to regularly clean the carpets. With this we offer information and advice on how to clean carpets in between such cleans. She did not want her carpets to get to such a deteriorated state again. Our client’s daily lives are very busy and they have so much to consider and juggle. It is often the case that they welcome support in one area that they can just forget about. They are then safe in the knowledge that their home carpets will remain regularly clean and will offer the best barrier against contaminants. If you would like to arrange a quotation for a time convenient for you please call today on 0300 088 2188.